What Are the Different Types of Deer Fencing? Learning about the different types of deer fencing available is critical if you have had a favorite shrub or perennial eaten by these pests and know that further damage is imminent. If you're not interested in making the switch from arborvitae to deer-resistant shrubs or from hosta to deer-resistant perennials, then fencing and repellents offer the best solutions for dealing with the problem. Fence Height: If you have ever seen the movie, The Yearling (1946), you know deer are great high jumpers, capable of leaping 8 feet into the air. Thus you will generally want a barrier-style deer fence (the most popular being metal or polypropylene mesh) to stand about 8 feet tall. Many other kinds of fencing cannot reliably keep deer from crossing your property borders. Allow for Slack: Even as big as they are, deer will try to push under fencing, too, so make sure there is no gap between your fencing and the ground. For polypropylene-mesh fencing, this means giving yourself some slack, letting this slack spill out over the ground in front of the fencing, and pinning it to the ground with stakes. Plan for Repairs: Any damage incurred by barrier-style fencing will have to be repaired promptly because a compromised barrier is not an effective barrier: Deer are smart enough to find where the breach has occurred and exploit it quickly. Keep Out More Than Deer: Depending on the type of deer fence you choose, you can keep other pests out, too, thus killing multiple birds with one stone. But you must select a kind of barrier-style fencing that has openings in it that are tiny. You may have to pay more for it, so decide whether the benefit enjoyed will be worth the extra cost. Durability: To increase durability, any metal deer fence you buy should be galvanized, any polypropylene type UV-protected. Don't Forget the Gate: Remember to include a gate or other means of accessing the garden area being protected. Deer-proof the gate, too. 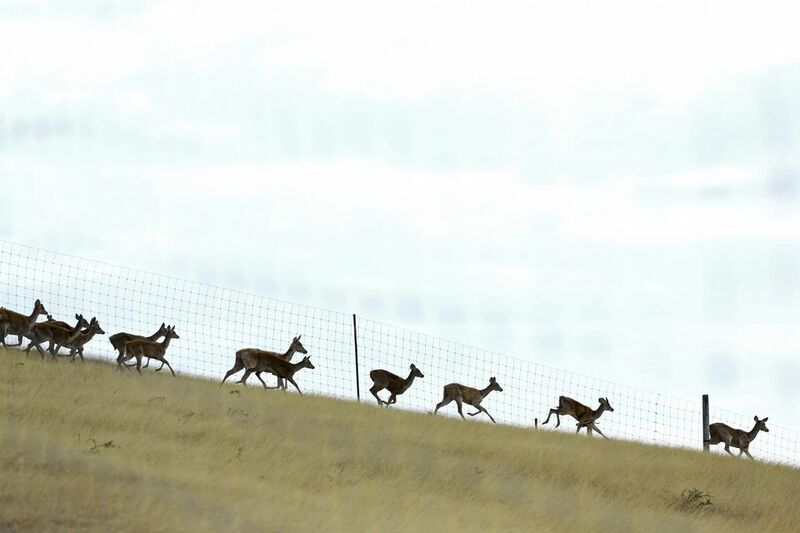 Deer fencing varies in cost, visibility, effectiveness, and durability. First assess your landscaping budget: If budget constraints are too burdensome, eliminate the more expensive choices immediately. The whole process, regardless of your finances, involves weighing the benefits and disadvantages of each product. Compromise is essential: It's unlikely that you'll be totally happy with all of the choices available. A number of choices are available to attempt the goal of fencing out deer. But we'll zero in immediately on these two options as being, all things considered, the best ones for the greatest number of gardeners. Con: The less expensive of these barriers don't blend well into the landscape. Pro/Con: The more expensive ones are somewhat invisible, being coated with black polyethylene. Con: Not as durable as the metal kind. Pro/Con: Higher-end types are effective because their breaking load is greater, but you'll pay extra for this. If you're willing to pay for a high-end product, the wire-mesh deer fences that have been coated in black are the best of the bunch, unless you hold relative invisibility at a premium. If you do choose polypropylene mesh, select a grade that has a breaking load of 800+ pounds. The "breaking load" figure signifies how strong the product is (deer are powerful animals that can rupture plastic fencing that isn't strong enough). Electric deer fencing consists of a wire or wires strung low along a border and has a mild shock. But it isn't considered a barrier. Instead, it is supposed to influence deer behavior, somewhat as an electric dog fence influences your pet's behavior. It's cheap and much less obtrusive visually than mesh, but not as effective. It's sometimes baited, the intention being to expose the animal to the shock, which discourages it from approaching the area in the future. A variation is a product known as "The Wireless Deer Fence." In this case, baited posts (with no fence, per se) are placed on deer paths leading into your property or around plants prone to be eaten by deer. Some conventional fences can also serve as deer fences. A chain-link fence can do so if it's 8 feet tall. In the case of solid wooden privacy fences, you can get by without the full 8-foot height. The reason is that deer can't see if a potential predator is on the other side, so they err on the side of caution and move on, instead of jumping the fence. But both of these types of fencing are expensive. Rather than fences, some homeowners prefer repellents. These range from the DIY types (human hair is a favorite) to commercial repellents that you can buy on Amazon, for example, such as Liquid Fence Deer & Rabbit Repellent. Depending on the product, deer are driven away because they dislike the smell or taste of the substance. But, whereas fencing represents a long-term solution to the problem, repellents offer only a transitory answer because you must reapply them after every rainstorm. What Kind of Tree Should I Plant in My Landscaping?